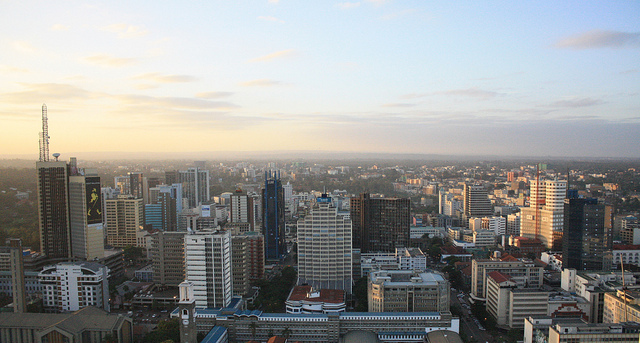 Kenya’s government hopes a new Nairobi International Financial Centre will transform the economy, but observers warn it could contribute to illicit financial flows, inequality and a lack of transparency. The Nairobi skyline. Photograph by Clara Sanchiz. For East Africa’s largest economy, these are turbulent times. Beleaguered Treasury Secretary Henry Rotich was summoned before parliament in October to explain reports his department was facing cash shortages. Delays to government payments have accompanied strikes among disgruntled public sector workers and complaints from private sector contractors. Fears over security have contributed to a slump in tourism, a weak shilling and shaken investor confidence. And shares are down on the Nairobi Securities Exchange, while the World Bank has cut national growth forecasts. Such troubles are unwelcome for any country, but provide a particular challenge to one hoping to entice investment into an ostensibly modernising economy. Kenya’s ambitious development plan, Vision 2030, hopes to secure the country’s middle-income status based on a “vibrant and globally competitive financial sector” at the heart of which is a plan to turn Nairobi into a regional finance hub through the establishment of the Nairobi International Financial Centre (NIFC). Despite ongoing turmoil in the economy, the Treasury is expected to soon table a new parliamentary bill regarding this proposed centre. Taking inspiration from gilded financial destinations such as London, Singapore and Hong Kong, Rotich hopes the NIFC will “attract international investments and participants in the financial services arena”. However, the plan does not sit well with all parties in Kenya, and critical voices are growing louder over concerns about the threat of illicit financial flows, rising inequality and a lack of transparency. Discussions regarding the proposed NIFC date back to 2008, but the plan first received international attention in 2013 when details emerged of negotiations between Kenya and TheCityUK, the lobbying arm of the City of London. It was revealed that UK trade delegations had undertaken several visits to Nairobi, continuing until September 2014, headed by then Lord Mayor of the City of London, Fiona Woolf. Since then, and despite some setbacks, the foundations of the project have been quietly put in place through a series of small legislative and policy changes. The Kenyan Cabinet gave approval to the establishment of the NIFC in June 2013, with a government steering committee set up to oversee the process. In May 2014, the Nairobi Financial Centre Authority was formed to oversee the development of a suitable policy framework. In April 2015, the government announced a deal with the Qatari government to advise on the model for the centre. Shortly after, in his June 2015 budget speech, Rotich promised that the centre was soon to be made “fully operational”. Meanwhile, previous legislation limiting foreign ownership of listed companies to 75% has been lifted to ease outside investment, and the City of London is reported to be contracted to provide training of staff for the centre. In addition to these developments, authorities have entered a bid to become the first country in Africa to host a Chinese yuan clearing house and have signed double taxation agreements with Qatar, Seychelles, South Africa, Kuwait,Mauritius, Iran and their neighbours in the East African Community. Some Kenyan financiers are now calling for the speedy conclusion to the set up and the offering of new incentives to bring in investors. From the perspective of the government, plans for the NIFC are moving in the right direction. But not everyone is convinced the centre will really contribute towards sustainable economic development in Kenya. A recent analysis by Attiya Waris of the University of Nairobi, for example, notes the difficulties of encouraging investment in International Financial Centres without taxation incentives or greater financial secrecy provisions. Similar centres elsewhere, writes Waris, have been found to attract illicit financial flows, while giving disproportionate influence to financial interests can undermine democratic institutions. Among the possible risks, she says, is the presence of those “seeking to launder illicit funds, such as those generated by tax evasion, drug trafficking, or corruption”. Nicholas Shaxson, author of Treasure Islands: Tax havens and the men who stole the world, meanwhile has said that in his view, the title “˜International Financial Centre’ is often “a deliberate euphemism for tax haven”. Many in Kenya are concerned that further incentives to attract investors under the NIFC will also exacerbate inequality. Tax Justice Network-Africa and ActionAid International estimate that Kenya already loses over $1.5 billion per year – more than twice the annual health budget – via tax incentives and exemptions, primarily to the benefit of foreign multinationals and larger domestic companies. Even the Kenya Revenue Authority has called on the government to withdraw certain exemptions and incentives in order to boost its tax intake. Furthermore, Kenya’s present financial architecture already has a reputation for secrecy and corruption. A 2012 study found it to be the easiest country in the world to set up an untraceable shell company, one of the most commonly used tools in illicit financial conduct. US research organisation Global Financial Integrity terms Kenya a “major money laundering hub” and calculates that illicit financial flows cost the government at least $3.9 billion in lost tax revenue between 2002 and 2010. Anti-corruption campaigner John Githongo has warned that in this setting, the NIFC “would be like a financial crime aircraft carrier, self-contained and able to cause considerable damage”. Another major bone of contention for critics of Kenya’s planned NIFC is the secretive process surrounding the proposals. The voices of civil society, whose involvement is constitutionally mandated, have so far been worryingly absent. Ezra Mbogori, Director of social justice organisation Akiba Uhaki Foundation, is among those backing calls for consultation, saying “the secrecy with which the thinking and action has proceeded so far leaves us concerned”. While Nairobi may not be transformed overnight with the arrival of the NIFC, the presence of an International Financial Centre would play a significant role in shaping the futures of both city and country. But for now, with scant information being made public, observers say it is challenging to even track the process of the establishment of the centre, let alone assess its potential impacts. Campaigners and researchers say the government has a responsibility to ensure a transparent and democratic debate around this process, particularly in advance of the tabling of the parliamentary bill. At a time of serious economic uncertainty, they say that such a debate will be crucial if there is to be any real sense of accountability for Kenya’s financial future. Daniel Cullen is a graduate of School of Oriental and African Studies, University of London, and a former graduate attaché of the British Institute in Eastern Africa, Nairobi. Africa needs an organized financial center and having it in Nairobi is wellcome. As long as the government is involved there should be no worries because it will be monitored by professional bodies including the UN. There are crooks all over the world but their presence should not make anyone shy away from establishing such a progressive venture. Leave Kenya alone. How many secretive things do all countries have? If you are doing graduate studies, just do you paper “secretively” graduate and and go away to start life in the real world. Let Kenya develop its NIFC and move on to become a first world country. “A 2012 study found Kenya to be the easiest country in the world to set up an untraceable shell company, one of the most commonly used tools in illicit financial conduct.” This is very telling indeed. Very informative & well researched article. Like many others, I highly doubt if NIFC plan is in the best interest of Kenyans. If it was, then why the secrecy? My take is that it’ll most likely serve the narrow interests of those in power and further impoverish ordinary Kenyans. The government should reveal more information on the plan to allow Kenyans to decide whether to support or reject it. Well put together article…covers both sides…the establishment of a financial hub is a good idea however the downside is the threat illicit flows and potential to turn into a “tax haven”. I think the treasury needs to be more transparency and openness about the running of the center and the regulations. Why can’t those having problems with this initiative simply ask the government for information instead of peddling unsubstantiated lies that there is “secrecy” on the part of the government. There are always those who will oppose or try to malign anything good. International reporters and so called researchers always try to undermine any great initiatives coming from Africa. Why not make suggestions on how Kenya can use NIFC to better serve its interests and those of the international community instead of trying to undermine it. If you can’t be positive then shut up. Nairobi has the talent and the skill to equal any financial center in the worldâ€¦but the Kikuyu must be kept away from the center of this sort of thing. They are the sort of people who will indeed, make this ‘the aircraft carrier of crime’â€¦..eh?